We were just a little early in posting the booking details for Germany 2019. Arena Travel are now happy to take bookings online from TODAY!! Already, many of you have already booked over the phone, and all the signs are pointing towards an early sell-out for the trip next year. Please book, and do it soon!! 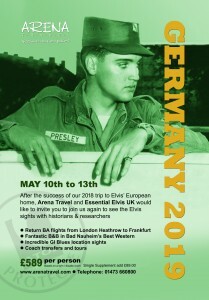 After the success of the 2018 tour join Arena Travel and Essential Elvis UK on this fascinating visit to Bad Nauheim, Germany, home of Elvis Presley whilst he was serving in the US Army and based in neighbouring Friedberg. You’ll see the locations that were an integral part of his life for the 18 months he lived there. Being Elvis fans and historians themselves, your tour managers will bring you a comprehensive tour of the Elvis sights and the stories behind them. Our research over the years has been so in-depth that we uncovered many forgotten Elvis treasures that even the local tourist board now highlight. It’s one you won’t want to miss! This entry was posted on Friday, July 27th, 2018 at 12:45 pm	and is filed under Essential Elvis News, General Elvis News. You can follow any responses to this entry through the RSS 2.0 feed.